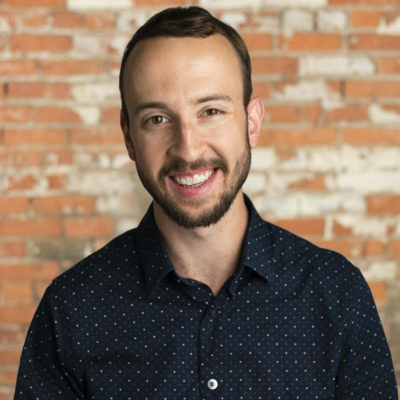 Every year, tens of thousands of welders make the trip to FABTECH, which is one of the largest fabricating tradeshows in the world. 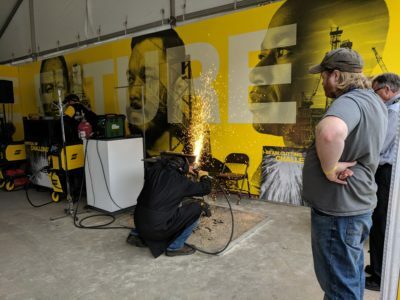 And every year, we team up with our client ESAB Welding & Cutting to help them prepare their booth. But this year was different. 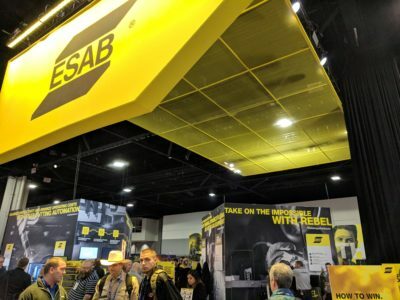 ESAB was planning its most interactive booth experience yet, so we took on more work than ever before – designing graphics for almost the entirety of the 11,000-square-foot space and an outdoor “extreme-challenge” area. And now that the show is over and the dust has settled, it’s safe to say we crushed it. 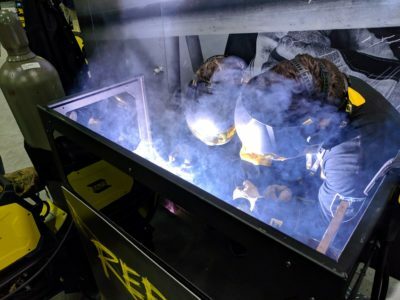 We wanted to show welders that together with ESAB’s expertise and industry-leading portfolio of solutions, it’s possible for them to shape the future of the industry. 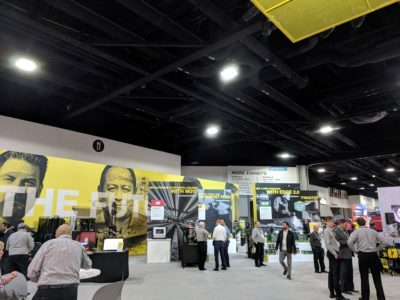 And show them we did – with a massive backwall graphic, an accompanying video, and an integrated communication approach to the dozens of other various booth graphics. If you saw it, there’s a good chance we helped to create it. 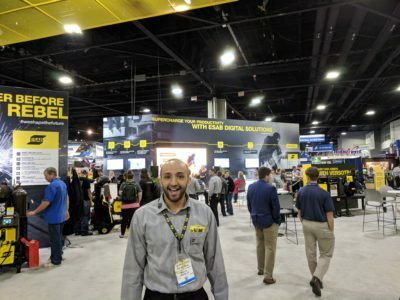 It was awesome to see all our hard work come to life in such a big way to help ESAB have their best FABTECH ever. The show was also a great opportunity for some Crowley Webbers to learn more about welding – and even give it a try. Here’s our director of digital strategy, Molly Chvala, finishing a vertical up Flux-Cored weld like a pro. If you think that’s hard to say, try doing it. 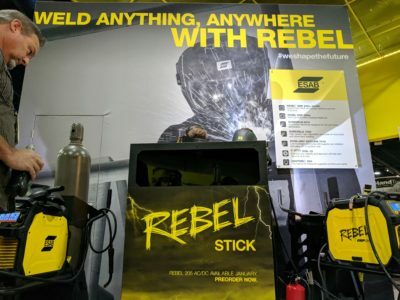 And our own brand champion, Joe Russell, stayed at the show all week to help work the booth and speak to welders firsthand. We’d tell you how much fun he had, but we think this picture says it all. 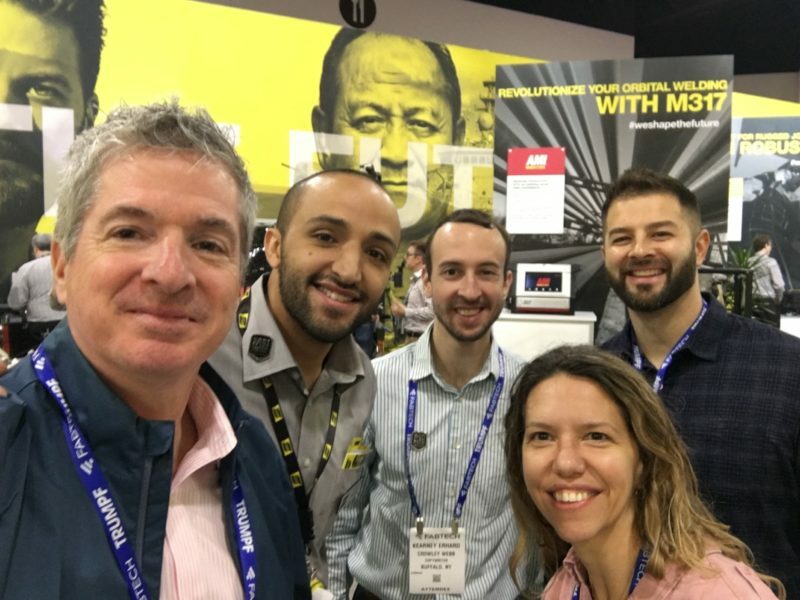 We had a great time at FABTECH 2018 and learned more about our client and the welding industry as a whole. You could say it was a job weld done.